On a beautiful fall day--the only day on our entire calendar that was completely empty--my husband, two kids (ages 10 and 8), and I packed our lunches and bikes in our mini van, and headed 35 minutes south to Duke Farms in Hillsborough, NJ. Duke Farms was originally owned by James Buchanan Duke (tobacco and electric power industrialist, and whose foundation supports Duke University) and then passed to his daughter, Doris Duke, in 1925. Before I had kids, I spent a day at Duke Farms, but at that time, visitors were only allowed to tour the grounds and beautiful orchid greenhouse by tram and were quite restricted by where we could go. Now, thankfully, much of the 2,740 acres is accessible--for free!--to the public through the 18 miles of walking trails, 12 miles of which are paved or gravel for biking, too. Though we took our own bikes, there is also a Bikeshare Service where you can rent adult bikes (no kid bikes available) for 2 hours for just $5 per bike (payable by credit/debit card). In addition, there is a free tram available April 1-December 1 that travels around the property and makes stops at select locations. When we first arrived, we kept the bikes in the car so we could check out the Orientation Center. We gathered maps and a geocaching brochure, asked the volunteers to suggest routes to take, and took a brief look at the interactive exhibits. We need to return soon to spend more time at the nature exhibits and we breezed through them to get started biking. After a brief stop along the path to rescue a praying mantis, we continued our bike ride to the Hay Barn, which was abandoned after a fire in 1915, then turned into a sculpture garden. We tried, unsuccessfully, to locate the geocache here, but my son did catch some Pokémon. (ugh!) Then we rode across the property (about 20 minutes ride) to the Great Falls, where water is released from the lake down the falls four times each day (10am, 12pm, 2pm, and 4pm). As we sat on the lawn to enjoy our picnic lunch, we could hear the water starting to trickle, then rush down the falls, then turn off about 10 minutes later. Next we did successfully find a geocache by a bridge near the falls, wrote our names in the book, added a trinket to the box, and returned it for the next finder. 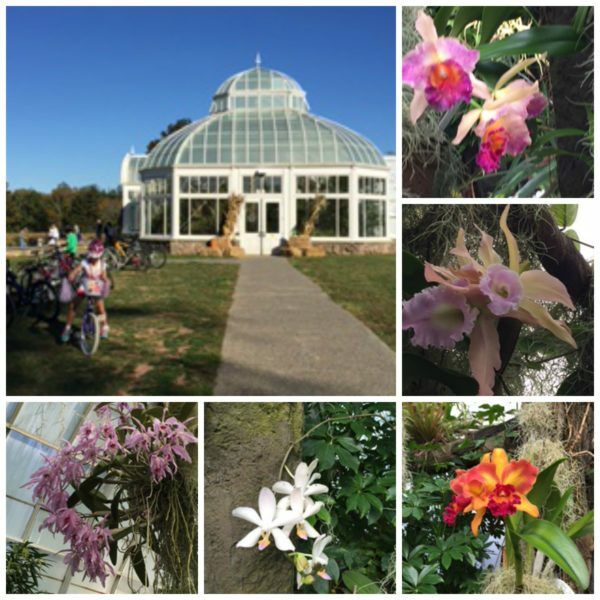 Our next leisurely ride took us to the Orchid Range that houses a Subtropical Display and Tropical Orchid House, which features some of the 1,500 orchids grown a the farm. My daughter spent much of her time taking photos of the wide variety of flowers here, and my son enjoyed learning from the docent about the various scents the orchids have in order to attract pollinators (rotting meat, human body odor, etc.). Our route then took us along a beautiful boulevard lined with towering trees (and a fox sighting! ), and eventually back to the Farm Barn Café at the Orientation Center for a well-deserved healthy juice. We all thoroughly enjoyed our day at Duke Farms. Our kids, who are definitely not biking enthusiasts, were too busy enjoying the scenery to remember to complain about biking! We are all looking forward to our next visit--maybe even with snowshoes this winter! Duke Farms is located at 1112 Dukes Parkway West in Hillsborough, NJ. From November 1 to March 12, the Orientation Center and Duke Farms are open six days a week Thursday through Tuesday from 8:30am to 4:30pm. From March 13 to November 5, the Orientation Center and Duke Farms are open six days a week Thursday through Tuesday from 8:30am to 6:00pm. Duke Farms is closed to visitation on Wednesdays as well as Thanksgiving, Christmas Day, and New Years Day.